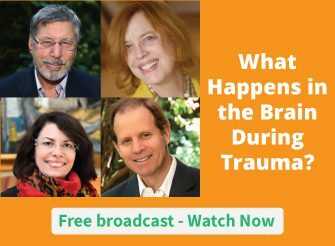 After trauma, it can seem like the lower brain – the parts responsible for our emotional reactions and our defense system – has been severed from the upper thinking brain. This can leave clients feeling the heat of their emotions, but without insight or cognitive reflection. Would this client experience a better outcome with a top-down approach or does this client need more of a bottom-up approach? You see, bottom-up approaches zero in on a client’s raw emotions and defense systems by working with clients to modulate their bodies. Meanwhile, top-down approaches look to shift the way a client thinks – whether it’s veering them away from unhelpful rumination or encouraging curiosity for their reactions. So we designed a tool to help you conceptualize the clinical options you might consider in working with a client who has experienced trauma. While either path can help a client begin to self-regulate, you need the right approach for each specific client. It’s also worth noting that your client may benefit from a mix of both approaches. You see, a blend of both can help clients begin to cope with their bodily experiences of trauma while they begin to think and feel differently about their experiences, their emotions, and ultimately themselves. Now we’d like to hear from you. What have you found in choosing whether to use a top-down or bottom-up approach? For me, it depends on how I am triggered for one. Then on the other hand, because I’m always called an intellectualizer, I believe the bottom up approach would work for me, in that I need help in learning how to deal with feelings and emotions. I like the concepts. Thanks! Please consider the posibility that it is Not in our brain where it all happens. The two organs with what I feel/know the most are my skin and my guts. I also do not find this particular graphic to be helpful. It looks as if the somatic therapies are very limited – and to leave off Somatic Experiencing, one of the core foundational therapies of bottom up work, was a huge oversite. And the explanation of bottom up is also very limiting and doesn’t capture the essence of it at all. I do generally find the graphics helpful, so I look forward to future ones. I find the Master Trauma series, as most of NICABM trainings, professional, state-of -the -art, inclusive of different approaches and perspectives, practical and affordable, and thus very helpful. That includes the aditional tools / resources provided (infoographics, handouts, etc.). Hi NICABM, Usually I have loved your infographics and appreciate them, but I think this one was a bit out-of-wack. 1) I have to agree with a lot of people below who noted that a lot of significant methodology was left out —Somatic Experiencing, Brainspotting, Neurofeedback, Polyvagal Theory, etc. Perhaps a legend at the bottom, as one person suggested, could have been helpful and informative for clients and wouldn’t take up as much room on the graphic. 2) I also don’t think that I agree with your definitions. Bottom-up therapy, in my training and experience, is not “how to help clients cope with raw emotions and defense reactions”; that kind of a definition would be a top-down/cognitive method. Teaching someone “how” is a cognitive approach. “How to divert and control your thoughts”; “how to change a tire”, etc. You learn from the top-down “how” to do something. How to cope sounds like conceptual learning, not experiential, as in bottom-up learning. A bottom-up approach is when the _body_ informs the brain; i.e., sensations actually _inform_ the brain and mind. Bottom-up is the understanding that the information from the body is critical to healing from trauma–whether we are talking about the vagus nerve (i.e., 80% of the information comes from the _bottom-up_ through the vagus nerve), the “gut-brain” connection, or, as in Feldenkrais or Somatic Experiencing, noting awareness of sensations and following them, seeing what comes next and learning from them and feeling yourself change _inside_. I’ve heard this from many of your presenters. I’ve experienced it myself and seen it in my clients. I was excited to see this graphic, as I am always looking for better ways to teach my clients and potential clients. Thank you anyway. But this one didn’t work for me. Bottom up. I did CBT for years and it did very little to assist me or help me understand why trauma was having such a devastating effect on my life. When I started doing ‘feeling’ therapies I started to make progress. I don’t think I’ll ever feel ‘good.’ But at least there’s some progress with bottom up work. Hello, therapy client here with a question. This graphic says that top-down approaches are about “how to help clients think differently”. However, in my personal experience of trauma therapy, working with thoughts has meant trying to understand what’s happening emotionally and why – usually by probing into the past or trying to uncover deep beliefs and wounds. This process has allowed me to feel the emotions shift and change as insight is gained and old wounds are acknowledged and mourned. However, I think this is very different from the CBT assumption that people must be having negative thoughts all day, and that these thoughts need to be corrected with logic. I’m not consciously trying to replace my thoughts, but using them as a vehicle for releasing pain and gaining emotional insight. Before this, I suffered from terrible brain fog, which has been lifting, so I didn’t have a whole bunch of obvious “negative” thoughts then. Is what I’m doing still considered a form of top-down processing? Sounds like you are getting excellent and integrated therapy that is tailored to your personal needs. Good therapy is like a dance, an art, as much as a science with applied techniques. IFS (Internal Family Systems) is a bottom up approach. It was very effective for me. I was electrocuted as a child. After decades of yoga, meditation, dance and other body-based therapies, as well as several years of psychotherapy, I discovered TRE (Tension & Trauma Releasing Exercises) about a month ago, which finally helped release the chronic tension throughout my body. It also initiated an unconscious release process which is best described by Peter Levine’s Somatic Experiencing, particularly his most recent book ‘In an Unspoken Voice: how the body releases trauma and restores goodness’. For the first time I feel like I’m making real progress, and reading his book makes me feel understood in a way that nothing else has ever come close to. Mindfulness of the body’s process is key, and it could be said that the understanding i’m gaining is a top-down process, but it is the bottom-up approach (TRE/Somatic Experiencing) that worked for me. By the way, I’m a music therapist (there was no option for this when entering my details). Ruth Lanius mentioned that a key factor to distinguish Bipolar (manic state) from symptoms of trauma is sleep: while the former perceives little need for it, the latter has great difficulty sleeping/often wake up feeling tired. I am wondering if the same principle holds true for Bipolar individuals in the depressive state. Is there/are there any salient differences in sleep in such cases. I’m disappointed, where is neurofeedback on this graphic? All of this discussion brings more awareness to the subject of trauma and the healing of it. Metaphorical strategies help the whole process. Been very nice to hear more…organized well for the practitioner! 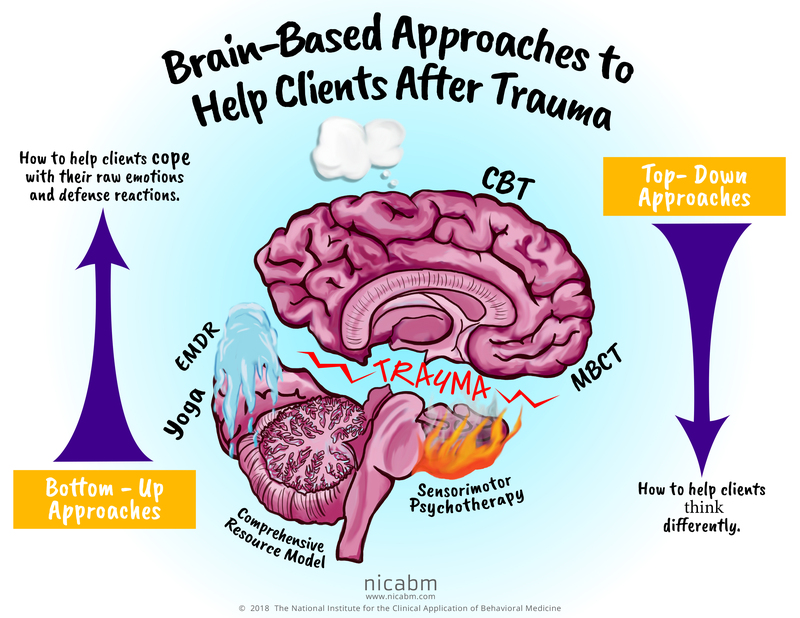 As a trauma therapist, I am wondering when Brainspotting is going to become more recognized as a treatment for brain-based work. It is fabulous and doesn’t cause the abreactions that EMDR can. Hi, good comments. Id like to have Brainspotting next to EMDR. Good idea (below) to have a legend with the variety of non talk therapies explained, SE for example. And indeed, without attunement healing is difficult. I so surprised that you did not include Somatic Experiencing as a bottom up approach in your chart, especially since Peter Levine is one of your presenters and a pioneer in the field. i like your infographic but need a translation of cbt mcbt emdr for it to be of use to me. I wonder why there is no mention of the therapeutic relationship in the diagram, either as a container for the work or as a crucial healing agent in the work as a whole? Working with the relationship allows for an integration of ‘top down’ and ‘bottom up’ approaches, particularly when we are addressing relational trauma where the trauma enters into the dynamics of the therapeutic relationship and can be responded to in a ‘developmentally needed’ way. Good model but this seems only to focus on talk based therapy. Where do you see physical therapies fitting? Eg. Touch/massage and exercise? Most of the modalities on the chart are body based (Mindfulness, yoga, sensorimotor psychotehrapy, etc.). I am really enjoying the series and think it very well done. Thanks to all involved. This visual reminds me of the Schiff’s Discount Matrix. Interventions are linked to levels of discounting demonstrated in a client’s behaviour. That model depended more on the therapist’s judgement of the behaviour presented (how can you know what you do not know!!) and it takes a different view of the top-up/top-down functions. Even so, both models highlight the complexities of negotiation with a client to ensure the direction and focus of interventions work with the client’s perspective (rather than the perspective implicit in our professional training). Another bottom up approach I use is art psychotherapy where l encourage clients to work with art materials in a sensory self regulating and soothing way. It blends very well with sensorimotor psychotherapy. Just writing a note to appreciate your comment, as an art psychotherapist myself. I was delighted to see art psychotherapy mentioned! I work in a team which also includes dramatherapists and music therapists. As you may know, the three arts therapies are professions registered with the HCPC (Health and Care Professions Council) in the UK. All three arts therapies offer wonderfully and infinitely rich and creative possibilities of working with sensory experience – for self-regulating and soothing as well as for working with the edges of the ‘Window of tolerance’ (a term which Pat Ogden uses). Such fabulous resources at NICABM! This is interesting, and I love your diagram. After studying hypnotherapy and EMDR, I found the most effective trauma release is narrative and rohun therapy. Using this, you get the story, thoughts in each moment and then emotions. Then, when you’re working with the client, as therapist you repeat the narrative and release the negative thoughts, emotions and the story. This is released from the body… As this is where trauma sits. It gets really hard/tough when one reaches the level of prenatal, preverbal trauma and one senses, has one’s braincircuitry changed and one’s dominant symptom is FREEZE sometimes to the point of being unable to breathe. I appreciate many of the comments but sometimes CPTSD/DID is so much harder/more difficult than many of the commenters/professionals realize/have experience with.